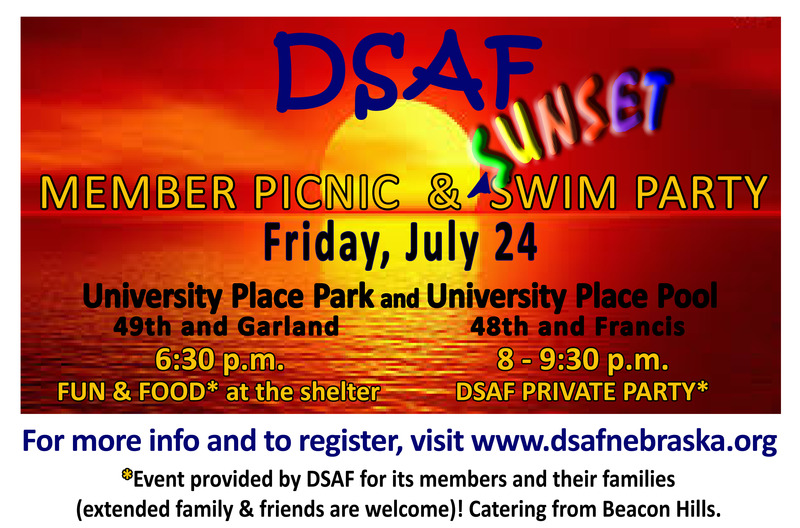 This event is provided by DSAF to its members and their families. Extended family and friends are welcome. Please indicate how many will attend (children and adults). to the DSAF MEMBER PICNIC AND SWIM PARTY! Join us at UNIVERSITY PLACE PARK (49th & Garland) - covered shelter - for FOOD (catering by BEACON HILLS) and FUN (there are tennis courts and a playground nearby!). UNIVERSITY PLACE POOL** (48th & Francis) - for a PRIVATE DSAF SUNSET SWIM PARTY! *This event is provided by DSAF to its members and their families (extended family and friends are welcome!). There is no cost, however we ask that you register to ensure accurate food counts. More specific details will be included in your registration confirmation email.